The newest arrival to Petoskey’s Gaslight District is coming to 207 Howard Street later this month. Mike Davies and Danielle Charles, the husband and wife team behind Dripworks Coffee, have set out to create a unique, inspiring space that will feature quality coffee, loose leaf teas, artisanal baked goods and a welcoming atmosphere. In the following interview, Danielle recounts some of the experiences and inspirations that helped her and Mike conceptualize their new cafe. We also take a deep dive into croissants, Petoskey’s permitting and planning process and how to design a cafe using Pinterest. 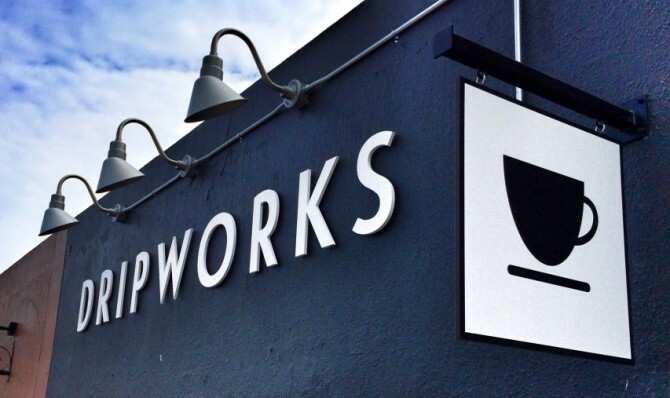 SE: Congratulations on the impending opening of Dripworks Coffee in Petoskey’s Gaslight District! When did you seriously start considering opening a coffee shop and was Petoskey always your number one target for a location? Danielle Charles: Thanks so much Tim! Opening a cafe of some kind was always in the back of our minds. It was more a matter of where and when. Like most people of our generation, there was a need to leave home and go out exploring, find our own way and all of that — and for years we just didn’t feel rooted enough to jump into something that required such an enormous investment and commitment. We spent time on the West coast, living in Seattle where Mike worked as a carpenter while I went to school and then on the East coast in Vermont. Neither felt quite right. They were both lovely in so many ways, but they didn’t feel like home. We would occasionally talk about moving back to Michigan, but I don’t think either of us were ready. I suppose we both had this idea that we would find the perfect place: a place that had a little bit of everything that was important to us. This quest for home even took us to England, where we spent a year living and working, trying to discover ways to extend our visas (unsuccessfully). But in the end, I think living in all these different places helped cement what was most important to us. So to answer your question in a very roundabout way, the thought of opening Dripworks first occurred while we were sitting on a park bench in Hyde Park in London one April morning. It was about 6 months before we were to return to the States. It was one of those beautiful spring mornings where the light is just so, and there was a slight haze in the air that really reminded me of Michigan. It was a strange feeling — as though London and Michigan had somehow merged into one place and I said to Mike how if only that could somehow happen, it would be the perfect place. I think it was in that moment that Dripworks was born. We realized that home isn’t something you discover or find; it’s something you create. It’s finding the place that has most of the things you need, and creating the rest. I guess Dripworks is our way of merging what we love about Michigan with the more European mentality about food and culture that we also love. SE: How has it been working with the City of Petoskey as far as permitting and planning is concerned? Do you have any plans to offer wine or beer in the future also? Danielle: I was terrified about the permitting and planning process if I am completely honest. But it has turned out to be a really wonderful experience. Not to say that it hasn’t been challenging, but on the whole people have been enormously helpful and generous with their time. A friend gave us the advice when we first started that we should think of our building process as a joint venture with the county and all the various inspectors and planning departments — and thinking of things in that way has made all the difference. I think most problems arise when you do things your own way and then find out too late that you didn’t comply with code. One of the first things we did was call up Penney Massey at the Health Department and Chuck Partyka of the Building and Planning Commission to go over our plans and find out what we needed to do. They were both amazing. We’ve worked with people all the way through and yes some of the laws are irritating, but people are just trying to do their jobs and if you remember that, you tend not to take things personally. Becky Goodman of the Downtown Office has also been an amazing resource for us in helping us locate a space and understand the demographics. It’s just a really supportive community for entrepreneurs here. I think it’s probably one of the best places to open a new business. No plans for wine or beer. Caffeine is our drug of choice! SE: I’ve read that you will be serving beans sourced from Madcap Coffee in Grand Rapids. Tell us a bit about Madcap and your decision process in choosing Madcap and were other coffee and roasting sources considered in Michigan or regionally? Danielle: Going into this, we knew that we wanted to partner with a roaster that shared our passion for quality and the stories of the people and processes behind the beans. It just so happened that there was a roaster embracing both of these things right in our backyard. We explored a few different roasters — Intelligentsia, Kickapoo Coffee out of Wisconsin, Counter Culture — but in the end you can’t beat being able to pop down and speak with people face to face. And even without the proximity, I think we still would’ve chosen Madcap. They are doing fantastic things in the world of coffee — with goals to be visiting and working directly with 100% of their farmers by the end of this year. Trevor, the founder, is a world-class barista with a competition record to prove it and has a really amazing palette. They’ve won the Good Food Award this past year which is a big deal in the world of specialty coffee. But beyond any of this, their coffees just taste better than most any other coffee we have tried. In fact, after drinking their coffees almost exclusively for the last 6 months, we find it hard to drink anything else! They’ve been incredibly supportive as well with training and equipment, space design — everything really! Andrew Grassmick, their wholesale distributor, has become a mentor and friend to us and Dripworks certainly would not be what it is today without him. SE: Please tell us a bit about three coffee shops you’ve patronized and how they may have inspired you with your Dripworks plans. Danielle: Here’s an interesting fact: neither of us were really coffee drinkers until we moved to England. We were tea drinkers, and of course still are. But it was, ironically, England that introduced us to coffee and sparked our passion. Or to be more specific, it was one little coffee shop down the street from where we lived in Falmouth, Cornwall: Espressini. Our very first day there, jet-lagged and confused and feeling really out of our element, we wandered into Espressini and found ourselves in what felt like an opulent Victorian living room (chandelier, damask wallpaper and leather armchair all present). There was something about it where we just immediately recognized we were in a special place, and the experience didn’t let us down. Rupert Ellis, the owner, was on the cutting edge of English coffee culture and had just opened his shop in a town that quite literally has 3 or 4 coffee shops on every block (something that gives us courage in the face of some of the backlash we have gotten for opening a third coffee shop in one town). But specialty coffee is an entirely different ballgame and he recognized that. He had a pour-over bar (the first that we encountered) and these very poetic descriptions of each of the coffees he he was featuring (a particular favorite was: plums mulled in deep burgundy wine touched with spice). He completely changed the way I thought about coffee. But he was also just a very kind and passionate person and you felt really welcome when you came in. He would always come over to the table and sit down with us and ask us how we were. He remembered what we liked. He brought in different artists from the university and had all kinds of events: pop-up restaurants, coffee dinners, even a disembodied physics club! It was just a really fun place. An alive place. The next place is actually one that we’ve never physically been to, so maybe I am cheating a little? ButRevolver Coffee in Vancouver has really shaped and inspired Dripworks. I think the problem with many specialty coffee shops who care about quality, is that they become unaccessible to anyone who is less than a coffee connoisseur. Like wine, the world of coffee can be really intimidating and breed snobbery. But Revolver is all about providing a space for people to explore coffee, no matter where they are at. They have a rotating menu of roasters, more brew methods than I can count and everything is done on a long bar where people can watch and ask questions as their drinks are being made. The whole process is very interactive and transparent and it is really more of an experience than anything else: a place for people to learn. And that sort of experience is such a far cry from walking in and and staring at a wall while someone pours you some nameless liquid out of an urn and hands it to you in a paper cup. Coffee is so much about relationships and interactions and we just love the approach that Revolver has taken in making the coffee experience available to everyone. The last place is not technically a coffee shop, so again I’m cheating a little, but it is a tea house so perhaps that counts? Dobra Tea in Burlington was a place we frequented a lot when we lived in Vermont. Dobra is an Asian style tea house with a 20 page menu of teas (no exaggerating here) from all over the world. Again, tea is not just a product here but an experience. You will never find a tea bag and they don’t have to-go orders, no paper cups. All teas are served in their traditional teaware and are loose leaf. Most of the teas are sourced directly by the owner on his trips to China. You know when you order where the tea came from, when it was harvested and how. There is a story behind it. Every pot of tea is accompanied by an extra pot of hot water so you can re-brew the tea yourself. You never walk out of Dobra feeling like you did when you came in. There is something that really slows you down about sitting, and slowly pouring out your tea, re-brewing it, smelling the aromas and seeing these beautiful leaves unfurling in your pot. Dobra is the inspiration behind our tea program. It is tea on an entirely new level. SE: What’s your “music ambiance” program going to sound like? It seems that most modern coffee shops these days rely on streaming services such as Spotify or Pandora, are you planning something similar? Do you envision different types of music suited to different day parts? Danielle: I’m so glad you asked that because music is a very underrated part of the cafe experience and it really shouldn’t be. Music can make or break an experience for sure! We will be using Spotify, which we fell in love with about a year ago. We’ve tried to create a look and feel in Dripworks that is timeless and so we will try to pick music that fits that. I think music really has to fit the feel of the day. You don’t want to hear the same thing on a rainy morning as you do on a bright sunny afternoon. You want something different on snowy December day than you do on a stormy July one. You will probably hear a pretty wide diversity of music at Dripworks because of that. Billie Holiday one day and The Clash the next, Hank Williams followed by Chet Baker. Rockabilly and old jazz are favorites. We just want to keep it interesting and different. SE: It’s been fun watching your progress on Instagram and Facebook. What are your views on Social Media marketing for a small business and did you take any advice before establishing a presence on various platforms? Danielle: Social media is really quite an amazing thing. Fifty years ago, even ten — the idea that you as a business could connect directly with your customers, reaching your target audience rather than throwing darts at a giant wall and develop these relationships with them, find out what they like and make it incredibly easy for them to spread the word about you — would have been just crazy. Especially considering you can do it for free. I think it’s essential and part of a new era of doing business that is more about relationships than anything else. I’ve worked as a copy writer in the past which included social media work, so I had an idea going in of what platforms I liked using and how. Facebook is great for connecting to customers, twitter for staying on top of trends and connecting with other people in the specialty coffee world. Pinterest and Instagram are just fun. I don’t think it matters what platforms you pick so much as how well you use them and enjoy using them. Being consistent is the key — as well as using social media to listen to your customers instead of just talking at them. SE: I understand Mike is a professional baker. Can you share some plans on Dripworks’ food program? Will there be a revolving mix of standard baked items based on seasonality, etc.? Willcroissants make an appearance?!? Danielle: Croissants will DEFINITELY make an appearance. They were the very first thing we knew would go on our menu. It is so hard to find croissants these days that aren’t made from pre-made dough. Mike has been perfecting his croissant recipe for about 5 years now and I think people will be really excited by them. They are naturally leavened and slow risen so they develop this really complex flavor. We will actually have about 4 varieties of croissants on offer: pan au chocolat, morning buns (a cinnamon roll made from croissant dough) and savory croissants such as harissa and gruyere. We will be doing galettes, scones, tea cakes and different cookies that will all rotate based on seasonal ingredients (rhubarb and strawberries will be making a big appearance in June). On the savory side, we will be doing pizettes at lunchtime which are small, individual sized pizzas topped with seasonal vegetables, fresh mozzarella or feta, and fresh herbs. Also we will have tartlettes; small tarts based in square tart pans inspired by the offerings of Rose Bakery in Paris. Baguette sandwiches are likely in the mix later this summer. Basically, the idea is sort of a European style mix of light bites and sweets. We love those old style European patisseries where there is this abundance of little things to choose from. SE: Reclaimed wood is very hip these days, did you work with an interior designer in coming up with your space plan and the materials you’re using? Danielle: An interior designer was definitely out of our budget and we wanted the space to be a reflection of our tastes anyhow. The strange thing is that we never planned to use wood at all. It just happened that soon after we started planning the space, Mike’s grandpa offered to donate his collection of hardwood and cedar he’d been saving up for a rainy day. We knew we wanted to do a simple black and white theme and spent a lot of time pouring over Pinterest looking at spaces we liked. The wood just really tied everything together and made the shop feel connected to the landscape. All the wood has come from Northern Michigan. Recently, one of my cousins also got in touch and donated some wood that had been passed down to her from my grandfather before he died. So there is a connection to both of our grandfathers in the shop which we really love. Everything in the shop, with the exception of the wiring and plumbing, has been designed, built and created by our hands (with the help of friends and family on occasion) which is something we feel really proud of. We wanted the space to feel completely unique and handmade – an expression of human hands and spirits. So many places these days just feel generic and lack personality. We hope we’ve created a space that people will find inspiring. SE: I understand multiple brewing types will be offered as well as single origin beans which is really exciting. What is your preferred method of brew? Along similar lines, do you typically drink coffee throughout the day or are you a “two cup every morning” person? Danielle: It changes all the time, but our current favorite method is a pour-over set up using the hario V60 dripper with a paper filter. It creates a cup with a lot of clarity, so you can get all those wonderful subtle flavors and aromas. I think Mike could drink coffee all day long but I am too high-wired to drink coffee after about 3 pm. I’m a two cup every morning girl. SE: The Lake and Howard area of Petoskey seems to be flourishing with the likes of Chandler’s, Beards Brewery, Symons General Store, North Perk Coffee, Spoon Foods,Gaslight Group Properties, Cutler’s, Lake Affect and more. Yet, less than a block away we have multiple vacant storefronts on Mitchell Street. What are your thoughts on this and do you plan to be actively involved with the Chamber of Commerce and the City Planning Commission and Downtown Development Authority in any way? Danielle: This is a great question and a difficult one to answer. I know we would both like to be involved in improving downtown Petoskey and making it a more vibrant community. Hopefully this is something we can explore more in the future. I know there is a project in the works to improve Mitchell Street which is exciting. SE: Let’s move the clock forward to about 9 months from today to next February. The winter doldrums have likely set in around the area and we’re down to our “winter year round population”. Are you planning any special events, classes or other promotions to encourage local patronage during traditional slow months for northern Michigan? Danielle: You bet. I’ve got pages and pages of events and product ideas. We will be doing free public cuppings (like a wine tasting with coffee) once a month throughout the year. We also plan to do workshops and demos on various aspects of coffee brewing and preparation as well as tea workshops and tastings. I’m exploring the idea of pop-up shops where we would bring in a local artist or producer for one evening to sell their wares and talk about their products. Another idea I have is to do special coffee dinners where we bring in a chef for a Friday evening and do a prix fixe several course meal with accompanying coffees. I probably have more ideas than are practical or possible to put into practice, but I want to make Dripworks in the true spirit of the coffee shops of old — a center of community and creativity, ideas, socializing. I think bringing in special seasonally related products and hosting events keeps things interesting and alive. Thanks to Danielle and Mike for taking some time out of their busy schedule for this interview. It’s an exciting time for the Little Traverse Bay region; now if we can just get someone to get to work on thatNoodle House concept life will be even better.